The efreet deck is a bit limited on creature selection. There are only so many efreet's in print. However the few that do exist are quite powerful. 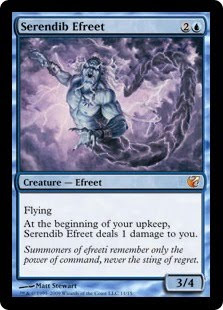 Old school favorites like the Serendib Efreet and Ydwen Efreet are quality undercosted beaters. The elusive Frenetic and Rainbow Efreet's are very difficult to get rid of because of their phasing abilities. Backing up the creature selection are staples from the blue/red toolbox. 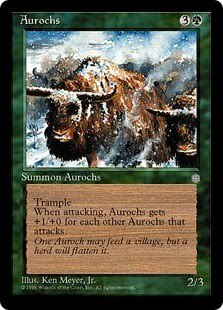 Echoing truth is an excellent permanent removal choice that also has the added benefit of harming token decks by removing dupes from play. Fire/Ice is a great utility or removal spell. Force of Will provides protection against threats that we otherwise cannot deal with. Prophetic Bolt is a potent removal option that replaces itself and let's us search for necessary answers. This deck can come out quick in the damage race and maintain that advantage with evasion. It has trouble dealing with large threats but with just enough tempo and reach can often finish off an opponent before major threats enter the battlefield. Rules: GW on the 'Ard Boyz finals, "you will be able to use allies." 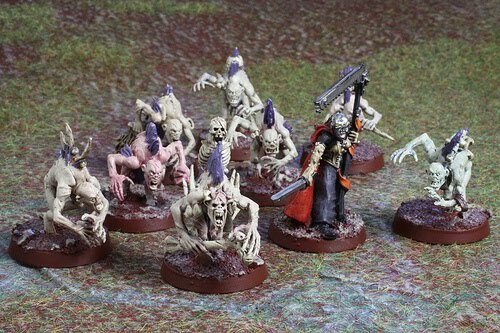 So as we discussed yesterday in this post, GW re-released the Daemon Hunter and Witch Hunter codices in digital form and scrubbed a couple of pages from the codices containing the allies ruleset. 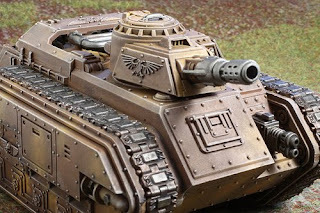 Since GW is a closed vault when it comes to actual useful information pertaining to the ruleset of 40k we can only speculate on what the hell they were thinking. Initial speculation was that this rules change was done to nerf IG and their nefarious usage of mystics, particularly for the 'Ard Boyz finals. Does such a drastic rules change done in such a sloppy manner and abrupt way make sense? It does not, and is awarded no style points. That said one might sympathize with GW if they were somehow concerned that IG was running rampant all over 'Ard Boyz and dominating the tournament scene. An IG on IG finals in every region would be slap in the face to any perceived game balance. So we ban allies because that somehow makes IG go from decent to overpowered? Not likely. That's actually a ludicrous assumption. That aside the idea is sound right? To balance the important upcoming highly publicized 'Ard boyz tournament right? A rule change at the 11th hour would make sense if they wanted that tournament to be affected right? So all of these changes were done under the cover of darkness at the 11th hour and with no explanation it wasn't even done for 'Ard Boyz? Was this done to screw over casual table top gamers? To throw RTT circuit's into chaos? To give INAT FAQ another 5 pages of content? These codices are deprecated anyway. If we don't make these rules changes to impact major tournaments then why bother? Just let the codex run it's course and abolish allies upon the next publication when you actually have a real writing and editing team. This company is completely incoherent at times. Rules: GW Nerfs the Daemon Hunters and Witch Hunters codices. We think. Grey Knights now carry walkie-talkies. So there are a number of blog entries floating around that claim the Witch Hunters and Daemon Hunter codices have been nerfed. I guess GW has released PDF updates to the DH and WH codices under the cover of darkness with no explanation. The gist? No more allies. We think. We're not exactly sure. It appears the Daemon Hunter codex was scrubbed of any mention of allies. The Witch Hunters codex? Partially scrubbed? There is still an allies sidebar but no mention of the rules in the text. I'm under the assumption these new releases (which are almost impossible to find on their website by the way) will indeed trump the print versions. Of course they are released with no fanfare and zero commentary from GW. They have been scrubbed with the same quality of a Steven Spielberg E.T. re-release. 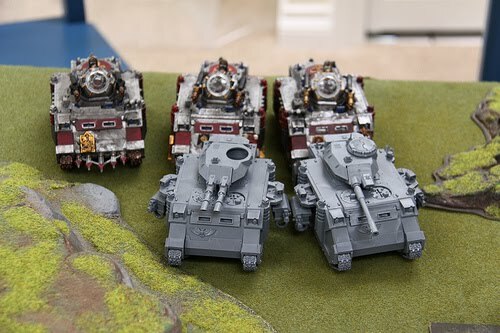 Grey Knights were an already borderline unplayable army. Now they lack allies, along with the decent inquisitor combo they had going for them. Walkie-talkies have replaced their nemesis force weapons. Was this really necessary? Were grey knights and witch hunters really dominating the 'Ard Boyz tournament season? These codices are so antiquated and have been for so long now why change this rule now? Why not just wait until we can release a proper codex update and then give the entire army an overhaul. How much fail do we have on GW's part when a PDF update to an existing pair of codices creates more questions than it answered? Where is the commentary on this from an official source? More to come on this. Maybe. 1. French version is renumbered, and HAS the missing two pages. 2. Spanish version has the old page numbers, and is missing the two pages. 3. English, German and Italian versions have renumbered pages and are missing the two pages. 4. There is no Japanese version. I guess we'll have to wait until tomorrow, since today's GW news says that they'll talk more about today's "great" release. So they aren't nerfed in France but are nerfed in other languages? Was this an intentional nerf or were they just releasing the PDF's because they are no longer available in stores? Was the intent only to nerf IG from taking allies but not from DH or WH inducting guard? Did they inadvertently nerf DH in the process? When Wizards of the Coast bans a card in Magic: the Gathering we get a three page dissertation from the game designers explaining why the ban occurred along with tournament data to back it up. When GW makes a rules change we get a complete train wreck that has no clarification or consistency. Making a vampire tribal deck pre-Zendikar was a difficult endeavor. You were looking at a number of high casting cost creatures without a whole lot of utility. Sengir Vampire, Moroii and Skeletal Vampire were your all-stars. M10 introduced the powerful Vampire Nocturnus, but it wasn't really until Zendikar that the most efficient members of the tribe showed up. Lots of cheap powerful creatures to fill the 2 slot, and powerful cost effective creatures like the Vampire Nighthawk and Malakir Bloodwitch. Mono color decks like this can also be challenging in an environment without sideboards. You have to be very careful that your deck can't get color hosed out of the game. Black can leverage hand destruction and artifacts to deal with the necessary problem cards. This deck closely resembles the Vampire decks we saw at Pro-Tour San Juan just recently. It obviously has a more powerful pool of cards to draw from though. 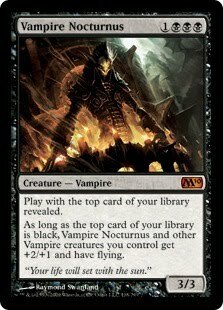 This deck employs Vampire Nocturnus as a potent weapon to augment the creatures in the deck significantly. Thoughtseize is a more powerful replacement for Inquisition of Kozilek. Nevinyrral's Disk an important staple to deal with problematic permanents that mono-black couldn't otherwise deal with. We also have access to Mutavault, Dark Depth's to combo with Hexmage and Cabal Coffers which allows us to ratchet up the power level further. The rest of the creatures are right out of Zendikar block constructed: The highborn, gatekeeper and aforementioned nighthawk and bloodwitch. Vampires is a very powerful tribe and this deck illustrates that while maintaining a strong tribal theme and even employing some cool soft combos. It's a solid deck for the format. So the Warhammer Fantasy Battles book is now available for pre-order here. It's a staggering $75. Don't get confused here. The 75 dollar sticker isn't some kind of fluffy deluxe edition with a nice hardcover, leather binding, tassels or a pretty carrying satchel (satchel?). No those are available here and here to the tune of $124. No the basic core rulebook for Warhammer Fantasy Battles is 75 bucks. Deal with it I guess. We're supposedly willing to pay it according to GW's market research. For those of you who don't want to dig through a PDF I'll post the money paragraph (pun intended). "The business model all our businesses follow is that of the niche marketer. Niches have some wonderful natural advantages. They are largely protected from macro economic factors, their customers are dedicated and loyal, and price isn't the number one consideration. To retain those advantages it is vital to have high quality products and services, and vital that the business should keep its focus and specialisation. The tabletop fantasy wargames niche that we have built at Games Workshop over the years has these advantages, and we do work very hard to provide the right products, the right services and to retain management's focus on our specialised offer." To be fair to the price, the book is massive. It's chocked full of photographs. We're more interested in pretty pictures than we are actual content apparently. Thus justifying the substantial cost of the basic rulebook in the eye's of GW. I don't currently play Warhammer Fantasy Battles. I'm not sure if I want to try 8th edition. My impression of 7th edition is that it's a terrible game. I'm interested to see if 8th edition is a major improvement. However a $75 rulebook I may not even want doesn't help me want to play the game or even try it out. I certainly won't be buying the book just to have it. I'll be considering acquiring it only after hearing input from other people regarding whether it's a quality game or not. Here's a hint GW: Try making your rulebooks as a low margin product or loss leader so you know, people new to the game might actually want to buy it, read it, and then buy your other products with massive margins, you know like the plastic models that are required to play? It was good enough for Dungeons and Dragons to do this and they didn't even have models to sell. Their core rulebooks back in 3rd edition? Twenty bucks on release (ok fine we can adjust for inflation and call it 25 or even 30) but still dirt cheap. $75 for the basic rulebook? That's cost prohibitive to new players or those on the fence. I mean really isn't this rulebook just a massive hardcover White Dwarf magazine? Those magazines are essentially just an advertisement that people actually pay for. Again, feel free to release awesome rulebooks and charge a premium, but maybe make sure there is a cheaper core option for the newcomers who won't drop all their disposable income on gaming right off the bat before even attempting to buy a plastic model. Perhaps I'll just wait for the 8th edition Battle of Skull Pass pocket rulebook. That rulebook is basically what I'm talking about. Still not sure about that though because that might require to drop another $80 on a bunch of plastic models I won't need. More discussion on this topic over at Yes the Truth Hurts here. I'll be sure to let everyone know in which way I cave to this price point as soon as possible. Kobolds were a fun deck building challenge. It's an interesting exercise trying to take advantage of a zero casting cost creature while desperately trying to ensure they don't remain 0/1 weaklings for any longer than a turn. I considered green as a color option for this deck. Green offered buff effects like Rancor and hand reload abilities like Harmonize. It's also notable that despite all the creatures being red this deck only really splashes it for a few spells. The deck ended up being mostly white. I chose that over green because it allowed for creature augmentation as well as quality removal and utility. This deck features 12 zero casting cost kobolds and then taskmasters and overlords to buff them. I included Mirror Entity as a quality finisher that doubled as a strong buff. The mana intensity of the effect is less relevant when you can just dump kobolds into play at no cost. On the utility side I use both plow and rings to deal with just about any threat. Shared Triumph is another efficient buff effect and I used that with Glory of Warfare and Ajani to make the Kobolds as threatening as possible. This deck can consistently ramp up to 3-4 power kobolds. They will indeed get larger if your opponent doesn't use his removal options wisely. Finally I included Sword of Fire and Ice. This deck can really capitalize quickly with card draw effects. It likes buff effects as well. The sword offers both and is another removal or reach option to boot. 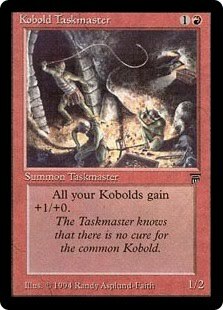 A kobold deck can be a challenge. But this one rises to it. Like its fantastic namesake, this is a quality deck that can swarm the opposition handily if not treated with respect. I guess maybe I should do these in alphabetical order? It's not intentional but my next deck just so happens to be tribal Barbarians. B is for beat down. Barbarians are a neglected tribe. They've had some solid contributors but kinda fell by the wayside compared to the likes of warriors, soldiers or knights. That doesn't make it a bad deck, but the quality cards aren't as obvious or as curve worthy. Still, the tribe has some power. There are enough quality aggressive creatures to form the early core and then a host of legends that can really tie the deck together. Balthor the Stout is a personal barbarian glorious anthem that can attack/block and breath fire to boot. Lovisa Coldeyes can make the deck stomp quickly. Just note that her effect is global and not just limited to the barbarian tribe. 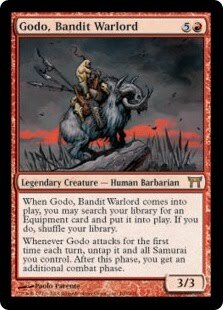 Red/Black works well for this tribe as it ties together the best of the creatures. It also offers great removal options like Terminate and Bituminous blast. The nature of this deck also allows for some powerful equipment that we can take advantage of. The deck plays pretty straight forward. Get some early damage in with cheap creatures and then magnify them with buff effects with either additional legends that make your army more powerful or equipment that does the same. The Blast fits in nicely here and can remove a threat and accelerate a creature into play. I like Nevinyrral's disk for needed artifact and enchantment removal or as a necessary sweeper to deal with protection creatures. This deck is land hungry and we're running 25 lands to address that need. 2 of them are mutavaults and can attack and block and as an added bonus benefit from both Balthor and Lovisa's buffs. We also benefit from a couple of quality legendary lands with can make any one of our 10 legendary creatures all the more powerful. This deck can get out of hand for an opponent in a hurry. With careful play you can make this deck work for you. Magic the Gathering: Duels of the Planeswalkers has finally been released for Steam. For those of us without Xbox 360's this is exciting, long awaited news. And yes this is a digital game. I play those sometimes. I also play Dawn of War and Dawn of War II. If anyone wants to try out Magic: The Gathering this is a good starter game. It's also the only MTG game you'll ever be able to play for 10 bucks. Take advantage. Tyranids win initiative and decide to go first. Orks choose not to sieze. Objectives are pretty much placed in the far corners. Tyranids are mostly grouped up to protect their objective, with 1 Tervigon placed on far edge, positioned to take the Ork Objective. Ork Battlewagons deploy across from bulk of Tyranids. Ork Truck and Deffkopta are deployed on far edge to protect Ork Objective. Deffkopta moves into cover, but takes a wound. Tervigon (a, far side), makes 9 gants, but rolls doubles. Tervigon (b) makes 10 gants. Tyranid army does some minor repositioning. Hiveguard (a) shoots at Deffkopta, but misses. Hiveguard (b) shoots at Lootas (a) and kills 2. Hiveguard onslaughts and shoots at Lootas (a) and kills 1, leading towards them failing a leadership test and moving off board. Both T-Fexes shoot at wagon, yielding a glance in total, shaking it. 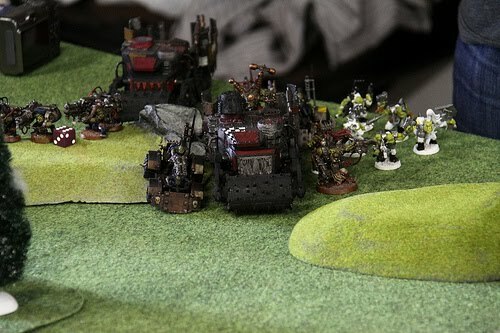 Ork Battlewagons, Truck, and Deffkopta move up towards Tyranids. Lootas (b) shoot at Hiveguard (a) and kills 1. Lootas (c) shoot at Tervigon (c), nothing happens. Un-shaken wagon shoots at Hiveguard (a) and nothing happens. Boyz in the same wagon shoot at Hiveguard (a) and nothing happens. Kopta shoots at Gants and nothing happens. Kopta assault gants and kills 1 gant. Gants hold. Tyranids shuffle around some more. Tervigon (c) makes 15 gants, no doubles. Tervigon (a) and gants shoot at Truck to no effect. T-Fexes shoot at Nob wagon, no effect. Hiveguard (c) shoots at Nob Wagon, glances, rolls a 6, which in Open Topped World yields a Wreck and Nobz fall out. Hiveguard (b) shoot at Nobz and kill 1. Hiveguard (c) shoot at Nobz and kill 1. Tervigon (c) assaults Truck but whiffs. Gants in assault with Kopta kill it. Gretchin arrive from reserve and move onto Ork Objective. Mek wagon moves up. Truck shocks Tervigon (c) and Boyz disembark. Nobz run towards T-Fex. Lootas (b) kill Hivegaurd (c), destroying the unit. Lootas shoot at Tervigon (c) and do 2 wounds. Boyz shoot at Tervigon (c) and do nothing. Boyz in wagon shoot at gants and kill 3. Nobz assault T-fex and gants. Nobz take 3 wounds, but kill everything in return. Boyz assault Tervigon (a) and inflict 3 wounds, and 1 boy dies in return. Tervigon (c) creates 8 gants. Tervigon (b) creates 11, but gets doubles. Rest of army has minor moves. Remaining T-Fex immobilizes the Mek wagon. Gants and Hiveguard shoot at Nob unit but only kill 1 Nob. Gants assault Boyz that are in assault with Tervigon, killing all of the Boyz. Nobz move up. Truck moves to try to block Tervigon (c) and Gants. Boyz in Wagon shoot gants and kill 6. Wagon shoots and kills 1 gant. Nobz assualt 3 units of gants and kill all 3 units. Tervigon (c) creates 13 more gants. Several units of gants start to swarm around Nobz. Tervigon and Gants shoot at Gretchin on Ork Objective and kill enough to force leadership test. Gretchin fail LD7 test twice in a row and they run off table, leaving Ork Objective unscored. 2 different gant squads charge the Nobz, who are already in combat with 2 other squads onf gants, and kill all but 1 Nob and the Warboss. Time is running out and the Orks have no troops left near their own objective to score. Mek Wagon is still immobilized and Nob and Warboos stuck in assault with Gants, which they are now bound to lose. Time is out. Game Ends. Tervigon as Troop is on Tyranid objective and base is big enough to prevent teh Nobz from contesting even if they did manage to escape the assault.